A job application remains incomplete without a winning cover letter. When you apply for the post of an administrative assistant, the resume might be fine and perfect, but the lack of a competitive cover letter may give you a setback. When you plan to conquer new job prospects, you need a Cover Letter For Administrative Assistant, tailored to perfection. These letters are effective in summarizing your abilities and enhancing the chances of selection. Here are some Sample Cover Letters that are commonly used. 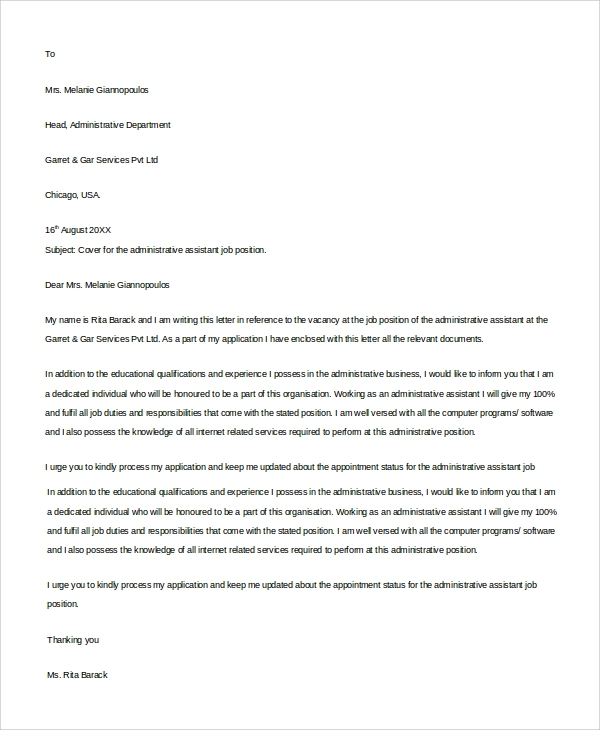 In these Example Cover Letters , the opening paragraph demonstrates the purpose of applying for the position. Follow it up with your qualifications and certifications in a nutshell. In the end, candidates need to discuss why they are suitable for the position. The name and address of the candidate are presented in the header area of the letter. The first paragraph begins with the most prominent experience. The achievements and other details are presented in bullets. This is a standard cover letter with three paragraphs. It is addressed to the recruiters, and the first paragraph introduces the applicant. The body deals with the importance of the candidate, and the last paragraph ends up in an obliging tone. 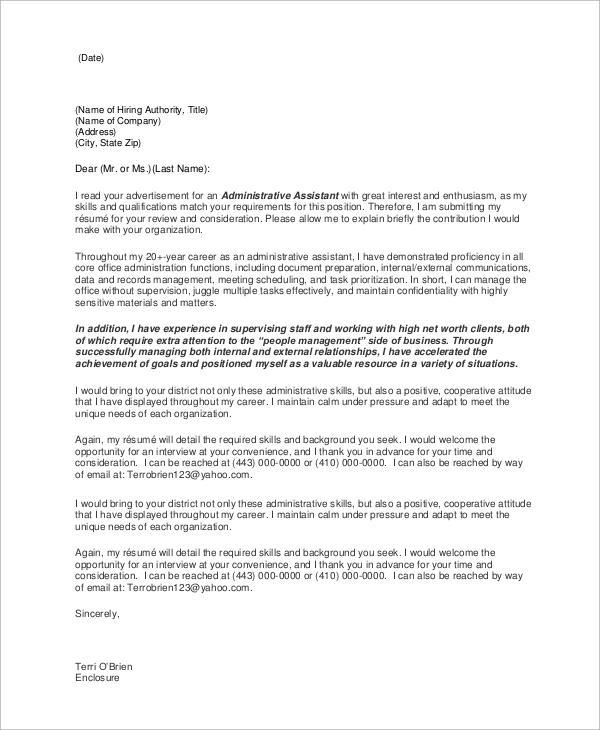 What should you include in an Administrative Cover Letter? You need to write a compelling Cover Letter Samples so that the recruiter finds it relevant and exciting. 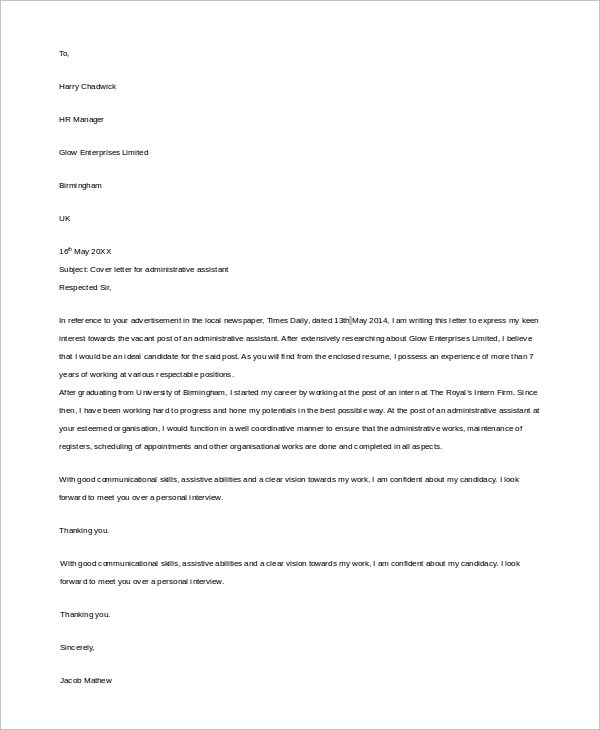 The letter consists of the introductory greeting, summary, achievements, qualifications and the concluding paragraph, justifying your selection. In the summary section, you need to be crisp and precise. It has to be an omnipotent capsule of your abilities and uniqueness. It is the summary that most of the recruiters read at the outset. In the qualifications and achievements, try to put forward the most remarkable ones at the beginning. The conclusion needs to be formal yet appealing. If the applicant has no experience at all, it is wise to start off with the abilities and skills. It is more functional in nature. and the reason justifying his/her selection is presented in the end. 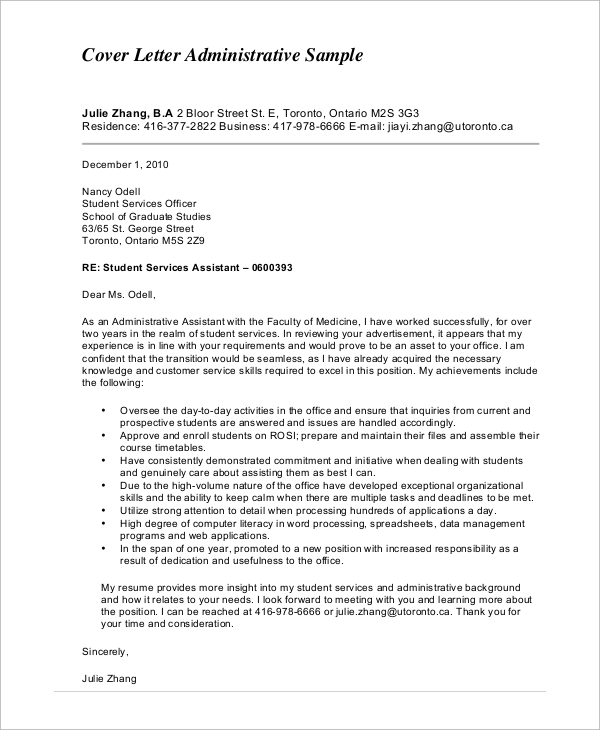 In this format, the letter starts off with an initial pitch and covers the academic achievements of the professional. 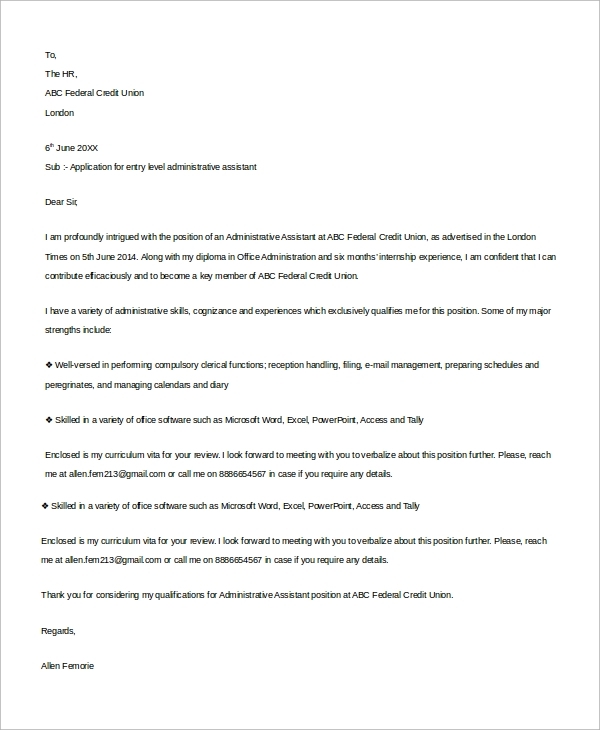 The letter ends with the abilities of the candidate, with a willingness to join the company. 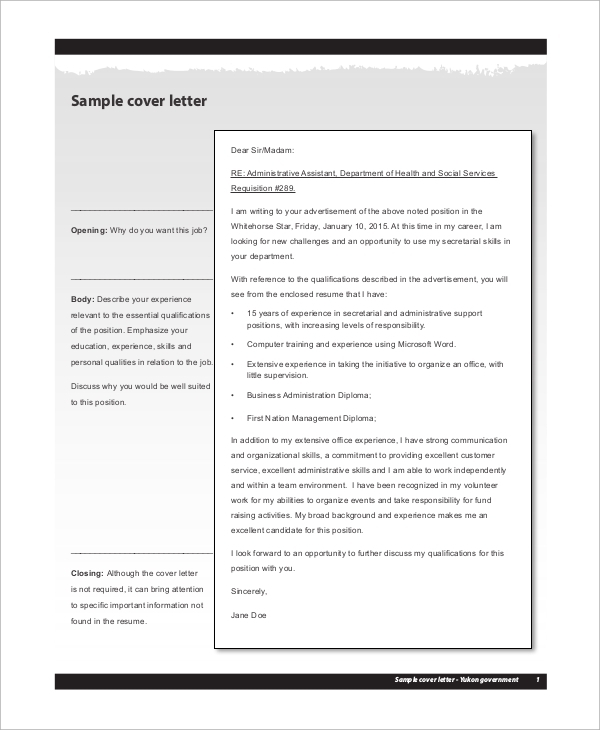 Why is an Administrative Cover Letter Important? There is a popular myth that a well-crafted resume is enough to win you a job. In reality, this ideology does not deliver its promises. Recruiters have to go through thousands of resumes. They look out for candidates with soft skills. The way you format the letter, the tone, and language, the choice of words and other factors highlight your overall abilities. If the recruiter finds your Resume Cover Letter engaging, he will proceed further into the main resume. Thus, a compelling cover letter is crucial to grab a job. If you are bracing up for an administrative job, you need a killing cover letter to spearhead your job application. This needs to be precise, formal and well-crafted. You can check out different Cover Letter Examples from the website and opt for the pattern that goes well with your profile.